Tyler Handley, co-founder of Inkbox, a semi-permanent tattoo company based in Toronto, poses for a photograph on July 23, 2018. The threat of a strike at Canada Post starting later this month couldnât come at a worse time for John Evansâs road and parking lot painting company, EverLine Coatings and Services Ltd. Autumn is when the cheques starting coming in to his Calgary-based business , which does the bulk of its work during the warmer summer months. About 90 per cent of his clients pay by cheque, and without that money, Mr. Evans wonât be able to pay his own suppliers. âWeâre at their mercy,â says Mr. Evans of his clients, who are mostly larger firms with long-established payment processes. A strike could also delay the companyâs own spending on products and services it needs to prepare for the next season. âThe key now is to adjust our cash-flow forecast, looking at the best- and worst-case scenarios," says Mr. Evans. His is one of thousands of Canadian businesses that rely on Canada Post to get paid or pay suppliers, despite the growth in electronic payments in recent years. Canada Post is also critical for the growing number of businesses that sell products online and use the Crown corporation as a more cost-effective way to ship their products to consumers. Me mbers of the Canadian Union of Postal Workers (CUPW) will be in a legal strike position on Sept. 26 after urban and rural carriers voted to strike if contract talks with Canada Post fall through. The company could also lock out its employees on that date. A Canada Post spokesperson said talks are continuing with the help of a mediator. CUPW says wages and working conditions are the major issues. In a release, CUPW said its working conditions have deteriorated amid the âcontinued explosion of parcel volumes, which has placed huge burdens on members.â It also cited the issue of a pay ga p between urban and rural postal workers. A potential Canada Post strike or lockout would be a problem for Toronto-based temporary tattoo company Inkbox, which uses the service to mail its products to customers across Canada. 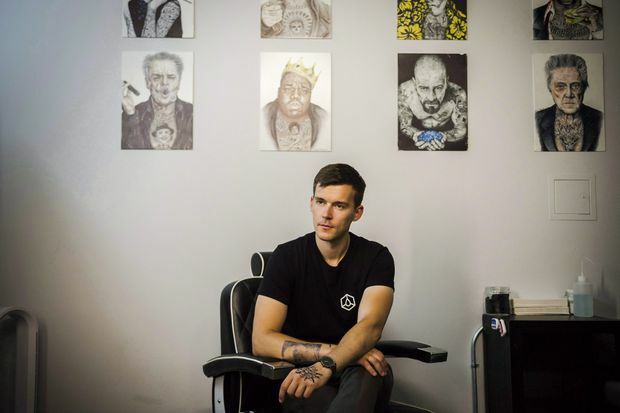 Inkbox ships about 60,000 tattoos per month to more than 150 countries, with 15 per cent of its sales in Canada, according to co-founder Tyler Handley. Mr. Handley says they use Canada Post at home in Canada because itâs the least expensive service. âFor our purposes and the size of our parcels, Canada Post makes sense,â he says. If there were a work stoppage, the company would have to turn to more expensive services to get its products to customers in Canada. If itâs prolonged, Mr. Handley says the company might host more pop-ups shops to sell direct to customers in urban centres. Jessica Watson, creator of PonyDry, a waterproof hair-styling product, uses Canada Post to ship her products from her Toronto warehouse to customers acro ss Canada and internationally. She has a separate U.S. warehouse and shipping service for her American customers. She also sells her products on Amazon.ca and Amazon.com, which costs her more money as the e-commerce giant takes a percentage of sales. If thereâs a Canada Post strike or lockout, Mrs. Watson says she might delay shipments from her warehouse for a couple of days, hoping for a quick resolution. If a work stoppage were to continue, she may need to direct most of her sales to Amazon. The warehouse would then lose business. âI have a great relationship with my warehouse. Theyâve got me out of many binds," she says. "I will do my best not to take away their business, but in the end, my customers need to be my priority." Anything that is shipped from her Toronto warehouse would have to be done at a higher cost using a courier service, she say s.
While itâs frustrating, Mrs. Watson says entrepreneurs need to be prepared for these types of hiccups when running a business. Other shipping companies stand to benefit from a Canada Post service interruption, as businesses and consumers turn to them as alternatives for getting their mail and packages delivered. When there was a Canada Post work stoppage in 2011, business increased about 20 per cent at the Packaging Depot, a shipping company with eight franchise locations across B.C. that uses couriers such as FedEx, DHL and Purolator, the latter of which is 91-per-cent owned by Canada Post. Manager Hamza Zaka said the company saw a slight uptick in business when a strike/lockout was threatened in 2016 and are seeing a small increase now, too. âPeople do tend to get scared about sending their packages in the middle of a dispute,â he says, adding that the current increase is mostly from c ustomers looking to ship important legal documents. âAs talks prolong and more people find out about the [potential] strike, the bigger the impact will be on our business," Mr. Zaka predicts.